Designed to put the 2009 IRC® code text in the hands of the deck industry in a customized format that includes explanations, full colored photos and illustrations related specifically to deck construction. 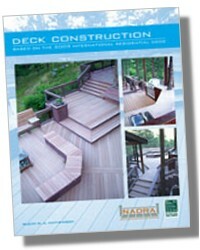 This book provides the 2009 IRC® sections relevant to deck design and installation. Deck contractors, designers, homebuilders, plan reviewers, inspectors, and manufacturers will all find this book helpful in completing their work in accordance with the 2009 IRC® provisions, and in enhancing their comprehension of how the code applies to deck design and construction. Unlike other deck books on the market, either with design ideas or how-to advice, the information contained in this book is organized in a manner that allows the reader to see and compare the author’s explanations and the IRC text simultaneously, thus increasing the credibility of the information herein. This book can be used for training and simply read cover to cover, or also can function as a jobsite reference of the IRC during plan approval, construction and inspections. Full-color photos and figures illustrate both correct and incorrect installations and intend to give the reader a clear understanding of installation practices to employ and avoid. Building, plumbing, mechanical and electrical provisions that may relate to a new deck installation are included.